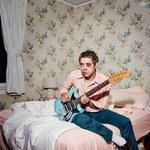 No one can accuse Mike Krol of not calling it like it is. Power Chords, the Los Angeles garage rockers' flared-up return, signifies a crucial stage in his career despite falling into familiar patterns. Having enjoyed some modest success after his debut with Merge in 2015, Turkey, Krol is now at that phase where his ramshackle songs progress into a more polished, hyper-catchy territory. From Jay Reatard's triumphant final bow (Watch Me Fall) to local lifers FIDLAR's gracious return (Almost Free), there's no good reason why he'd also want his music to languish into the same lo-fi hijinks of his previous three records. True to his word, there's hardly a moment of respite throughout Power Chords' vigorous 34 minutes. From the bubbling pop sensibilities of the title track to the fuzzed-out Little Drama, Krol likes to balance his clamoring anthems with the tight, compact songcraft of his hometown's classic seventies power-pop. He hardly takes a break through his frenzied compositions, a natural response to the constant self-depreciation that fuels his conflicted thoughts. As a form of therapy it's quite effective, but once Krol reaches the middle-half and you notice he's still cranking the same guitar lines (I Wonder) it turns wearisome. Otherwise, Krol can carry a tuneful melody when he so chooses - the main guitar lick of An Ambulance is so good that it should cover that hospital bill once he's released, while the gyrating, Albert Hammond Jr.-like punk-meets-rockabilly swing of Left for Dead enlivens his droll vocal dynamics. But outside of these moments, Krol sticks to the same tired garage-rock trappings that his SoCal scenester peers are unwilling to leave behind. Fun, but also forgettable, Power Chords marks a not-so-bold transition for an artist who's on track to reinvent his sound.